Francine has Sky rocketed herself back in the public eye as she took us all by storm in this year’s Britain’s Got Talent.Winning the public vote on the semi final and securing a place in the final, which makes Francine one of the most talented people in Great Britain. Also the only woman impressionist comedian to make live shows ever. Since Francine’s continued success she has recently appeared on TVs favourites This Morning, Loose Woman and Day Break , Celebrity Chase, Britain’s Got Talent, Sunday Side Up , with regular appearances on Big Brother BB boxes channel 5. With being featured in the tabloids and magazines in the last few months, makesFrancine an instantly recognisable face. 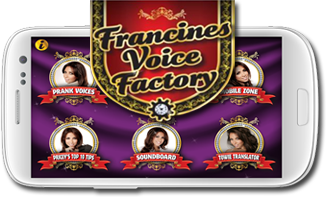 Francine has gone on to be nominated by the UK public for The Most Popular Female Personality of the year and graced the top ten most viewed YouTube clips with her audition clip getting million’s of views! Which made the six oclocknews!! She has since attracted over 250,000 Twitter followers, illustrating how she become one of Britain’s most sought after comedy faces. Star of Channel 4’s much acclaimed ‘VIP’, Francine started doing impressions of her teachers and fellow pupils when she was only 5 years old. She was both accurate and humorous and was always being asked to entertain her family and friends. She went on to join Kids & Co. Drama School in London, where she studied acting, singing and dancing. As a teenager she became a television soap addict and picked up the mannerisms and voices of the characters with ease. Over the years she has continued to extend her range of characters, including male personalities as well as female. Today her favourite impressions include Sharon Osborne, Katie Price, Geri Halliwell, Amy Childs, Vanessa Feltz, Janet Street Porter, Cheryl Cole and Dot Cotton, StaceySoloman, to name just a few! She is regularly booked to perform her impressions set live and loves nothing more than performing in front of a live audience. Although impressions are her forte, she is also an experienced comedy actress and has graced many stage productions including most recently Christmas 2013 Francine appeared in the west end as the Fairy Godmother in Cinderella at the Shaw Theatre, and previously has starred in Aladdin, Minstrel Spectacular, Snow White and Babes in the Wood. In June 2012 she took a cameo role in ‘WAG the Musical’where she got to sing and act as hilarious comedy characterCharmaine. @MossBros Where about are you?